The Town of St. George, New Brunswick held its annual Santa Claus Parade last weekend and families came out to enjoy the festivities, which included skating and hot chocolate with Santa. St. George has a population of 1,500 and is the centre of the largest aquaculture industry in North America, harvesting Atlantic salmon, scallops, herring, clams and lobster from the icy waters of the Bay of Fundy. 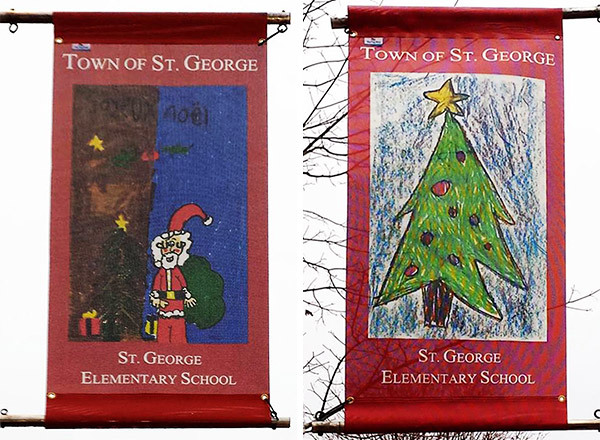 This Christmas, the people of St. George are celebrating the kids in the area, who submitted Christmas-themed coloured drawings, as part of a special street banner project. Local schools were invited to participate and were encouraged to create group and individual drawings. 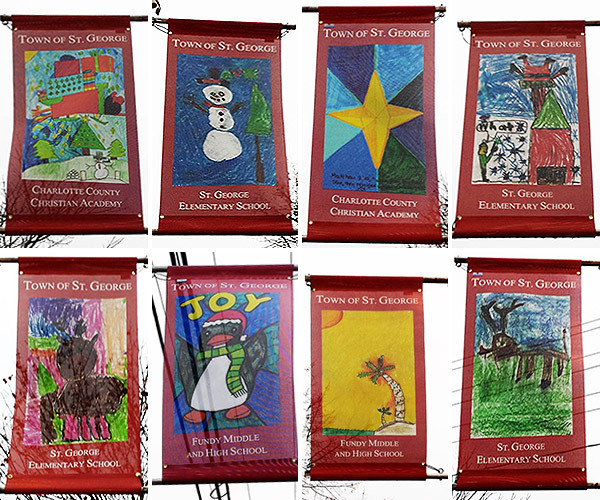 Visit the Town of St. George’s website to see more of their beautifully decorated streets. The West Broadway Business Improvement Association (WBBIA) represents more than 300 businesses and property owners on West Broadway between Collingwood and Larch, in Vancouver, BC. It was back in 2011, that a group of West Broadway businesses submitted a proposal to municipal council to be designated as a Business Improvement Area (BIA). Through this designation, the business community would agree to join together to bring improvements to the area. All businesses were consulted and a special bylaw was passed. This was the beginning of the WBBIA. 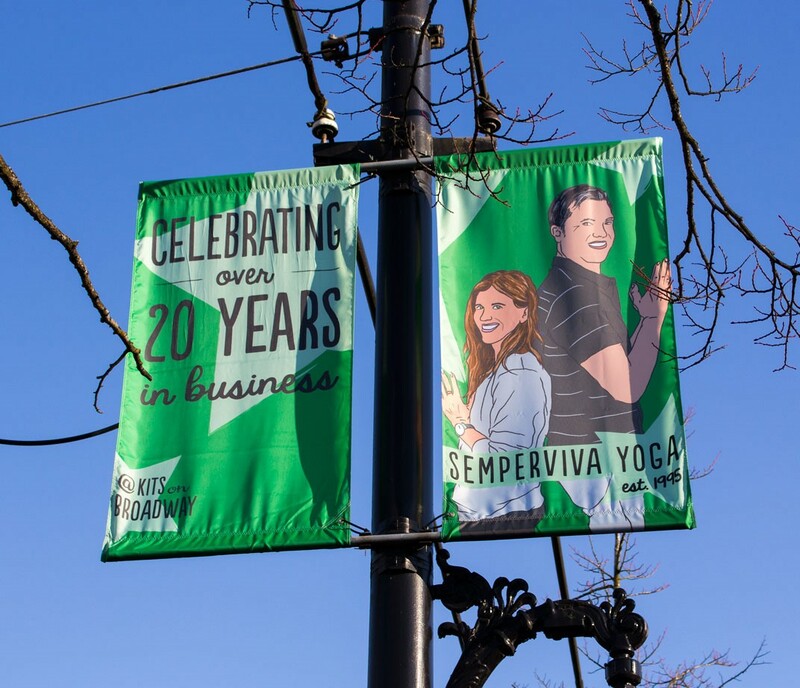 Last month, the WBBIA launched its Stars on Broadway initiative to acknowledge and celebrate business owners who have been serving their community for 20 years or more. Some of The Flag Shop staff were in attendance at a special launch event, and were honoured to be a part of the celebration! Founded by Lorne Atkinson, Ace Cycles was born out of a love of cycling. For Lorne, being a celebrated cyclist and talented mechanic, it was a natural fit to take over an existing bike shop on West Broadway and make it his own. He loves the neighbourhood so much he even moved his family there. Says Lorne’s daughter Jan, “We all love the natural beauty and the welcoming neighbourhood.” A real family business, many Ace Cycles customers are not only first-, but second and third generation. For nearly 65 years, Finn’s on Broadway has been fitting men in quality clothing. Though the quality brands they carry have changed and evolved over the past decades, two things have remained: their commitment to quality and to providing excellent service. This diner is rich with history, having originally been named Sunshine Cafe back in 1970. Today, “The Sunshine” remains in the heart of Kitsilano in Vancouver, – or what the owners like to call “home sweet home.” Owned by the Pantsios family for over 21 years, they are proud to serve quality ingredients while providing excellent service. The Toybox has been a Kitsilano landmark for decades. “Kitsilano customers are perfect for the specialty retail business,” says, owner Gary Mussatto. “They tend to care more about the quality of products and less about what’s popular on television.” When the store moved across the street from its original location, it was transformed into a toy factory, complete with conveyor belts, painting and wrapping machines and even a secret tunnel. Nick Panos opened Omega Travel in the heart of Vancouver’s Greek town in Kitsilano. Initially established to help the members of the Hellenic community travel to Greece to spend the holidays with their families, Omega Travel has evolved over the last 40+ years to become one of Western Canada’s leading travel agencies. Nick is a founding and current Board member of the West Broadway BIA, a co-founder of Greek Day and serves as a long-standing member of the Hellenic Congress of BC. Bellissima proudly opened its first location in 1975. Situated on Pender Street in downtown Vancouver, husband and wife team, River and Serena worked hard to grow their small business. Providing fabulous styles ranging from casual wear to formal, and specializing in business casual, customers are sure to find everything they need, from the perfect evening dress to comfortable and stylish outfits for the weekend. Today, Bellissima is still a family run business which has grown from one location, with a staff of four, to 22 stores across Canada, employing over 400. Phyllis Simon decided to take her love of children’s literature and her librarian’s skills and venture out into the business world. Kidsbooks started small and grew slowly to take on more challenges as the bookstore grew. What remained consistent throughout the decades was the owner’s belief that books have a certain inexplicable magic and that paper books with actual pages would endure, even in view of the technology of today’s world. Established in 1986, with a limited inventory in a modest space, this shop was one of the first private wine stores in BC, not to mention the first in Kitsilano! “We love the neighbourhood, the people and the history,” says Rosina. “Our customers and long-time neighbours are like family. They have seen us grow up, we’ve all grown up together.” Originally started by their parents, siblings Jason and Rosina Li, with Christopher Reid, continue the family legacy with passion and enthusiasm. They love to collaborate with like-minded businesses to host tastings and events, and share their love of good wine, and good company. Owned by Nat and Franco Bastone, Nat’s New York Pizzeria’s thin-crust, Neapolitan-style pizza originated in Nat and Franco’s great-, great-, great- grandmother’s kitchen in Naples, Italy back in the 1900s. In 1991, Nat and Franco traveled to Yonkers in New York to learn the 100-year old family secret behind hand-tossed pizza and the famous sauce. They returned to Vancouver and proudly introduced their family’s thin-crust pizza to Kitsilano in 1992. Visit kitsonbroadway.com for helpful links and contacts. Visit bia.bc.ca for more information about BIAs in BC. It’s been a great year for The Canadian Club of Vancouver! The Club had its beginnings 110 years ago, in 1906. In the 1920s, The Club was a leader in a local initiative to erect a cenotaph in Victory Square, honouring Canadian war veterans. 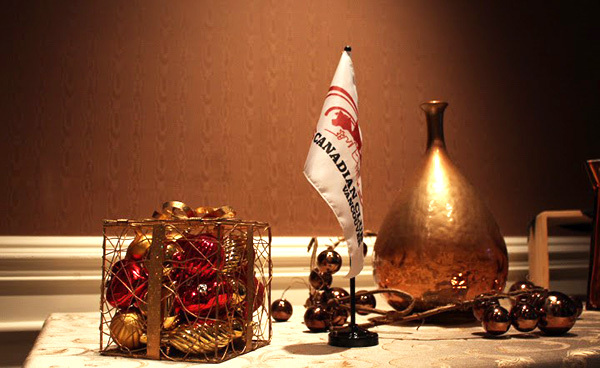 Actively pursuing its goals to foster fellowship among people, and encouraging the celebration of the Canadian identity while creating dialogue around matters of national significance, the Canadian Club of Vancouver continues to be a community leader today. And, though the Club has evolved since its founding, it continues to focus on hosting meaningful events featuring guest speakers who share knowledge, insights and personal pride in Canadian pursuits. The Club is also involved in important citizenship ceremonies for new Canadians, as well as in hosting the BC-Resident Order of Canada Luncheon. 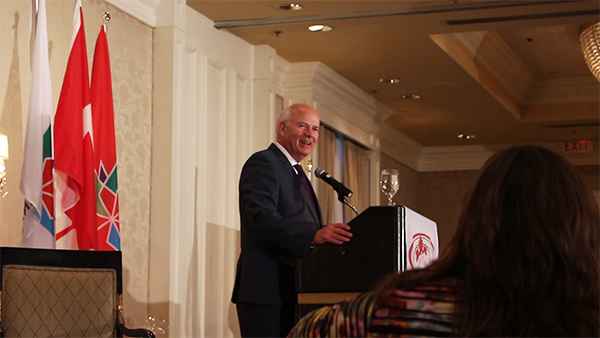 Even in view of his outstanding achievements and accolades in journalism, there is a certain humility about Peter Mansbridge. In the same way that he has been a dinner guest in our homes for decades sharing the evening news, there is a warm familiarity with his signature voice, as well as the manner with which he lets his stories unfold before his audience. We hung on every word. He shared many captivating stories, told with compelling detail, three of which addressed the meaning of being Canadian. He made the audience laugh uproariously – and he made us beam with personal pride in our Canadian heritage. The event also featured the Henry Hudson Elementary Intermediate Choir, comprised of students ranging from Grades 4 to 7. The young choir sang traditional Christmas carols and, at the start of the event, performed the Canadian National Anthem. Textile Image Inc. | The Flag Shop is a proud sponsor of The Canadian Club of Vancouver and looks forward to supporting banner events in 2017, including Canada 150 celebrations and the 50th Anniversary celebration of The Order of Canada. Please visit Canadian Club of Vancouver’s website for membership information and sponsorship opportunities. 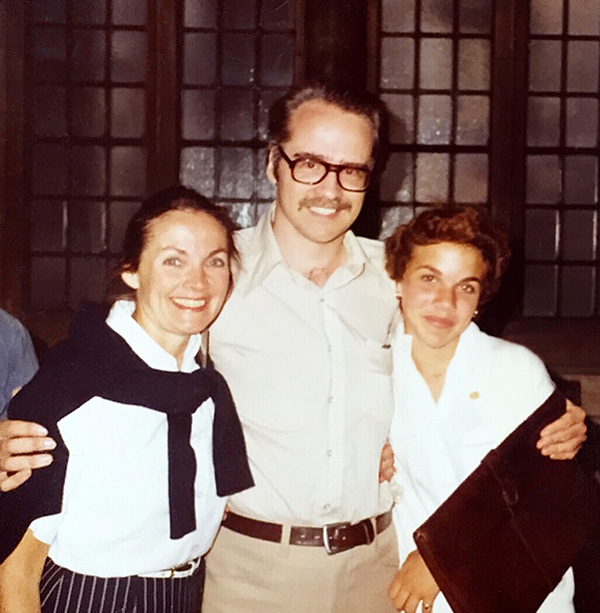 The Flag Shop is deeply saddened to learn of the passing of Dr. Whitney Smith, on November 17, taken too soon by Alzheimer’s disease, at the age of 76. 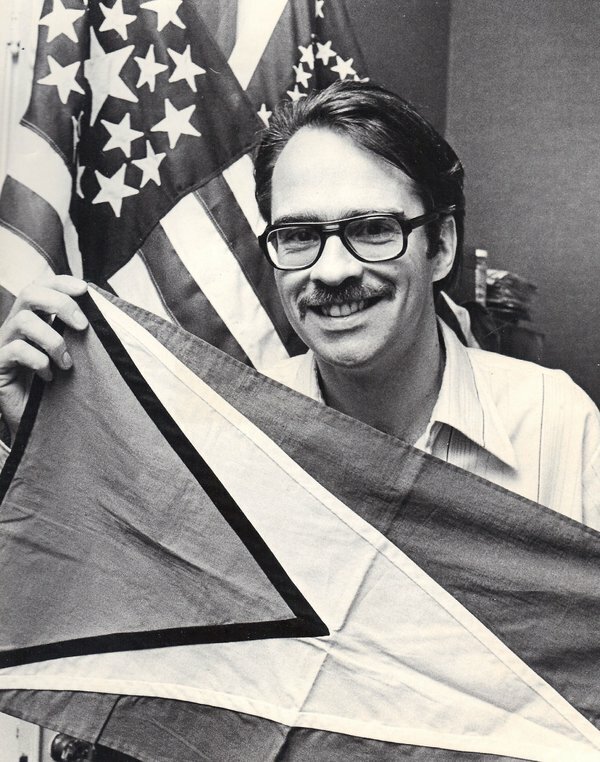 Dr. Smith was the President Emeritus, founder and first president of the North American Vexillological Association (NAVA). He was passionate about the pursuit of knowledge of flags, as well as the advancement of the formal study and analysis of flags, coining the term “vexillology.” Throughout his life, he dedicated himself to the pursuit of all things relating to flags. Whitney was truly the greatest of his time and through the work of NAVA, he gave flags immeasurable significance in today’s culture. As a small boy, Whitney became obsessed with flags and his enthusiasm only grew with the passage of time. In 1961, Dr. Smith and his colleague Gerhard Grahl co-founded the world’s first journal on the subject of flags: The Flag Bulletin #234, and a year later, in 1962, he established The Flag Research Center, as its director and all The Flag Shop locations across Canada came to rely on him for his knowledge and expertise. Indeed, he became known internationally as the foremost vexillological expert, providing influential knowledge about all aspects of flags. Throughout his amazing career, he authored scores of books including Flags through the Ages and Across the World, The Flag Book of the United States and Flag Lore of All Nations. He also wrote more than 250 articles for the Encyclopedia Britannica. It was Whitney’s books that gave a name and deeper significance to what we do. His passion paved the way, sparking interest and dialogue among flag enthusiasts the world over. Dr. Smith was the designer of flags such as the national flag of Guyana. As Guyana was emerging from British colonial rule, Smith wrote a letter to an independence leader and asked what the new country’s flag was going look like. He learned that a flag had not yet been designed and was asked for ideas. Whitney designed a prototype, depicting a golden arrow-like triangle with an overlapping red triangle against a green background. The flag was adopted, with minor modifications. Dr. Smith learned about the adoption of his flag design six years later, when Guyana gained formal independence. Before the age of the internet, he was the forefather of the flag movement in North America and internationally. Whitney was known for designing the flag for the Saudi Navy and for advising the Smithsonian Institution about the preservation of the Star-Spangled Banner which flew over Fort McHenry during the War of 1812. Dr. Smith also contributed to the design of flags for the islands of Bonaire and Aruba. In his lifetime, his vast collection exceeded 4,000 flags. The Flag Shop extends deepest condolences to the family, friends and colleagues of Dr. Whitney Smith. He will be missed by flag buffs, experts and vexillologists around the world. You are currently browsing the The Flag Shop Blog blog archives for December, 2016.